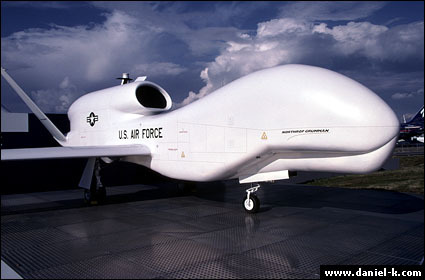 Produced by General Atomics Aeronautical Systems of San Diego, the Predator UAV drones are 27 feet long with a wingspan of approximately 49 feet. With a loiter time of up to 40 hours and a maximum ceiling of 25,000 feet, these aerial "eyes in the sky" can observe enemies in high-risk areas without endangering an aircrew. 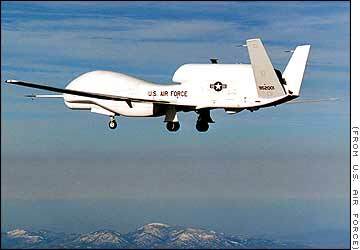 Primary function: Airborne surveillance reconnaissance and target acquisition. 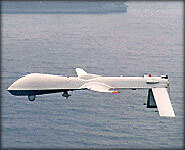 Contractor: General Atomics Aeronautical Systems Inc.
Real-time surveillance capabilities and imagery from high altitudes for long periods of time. 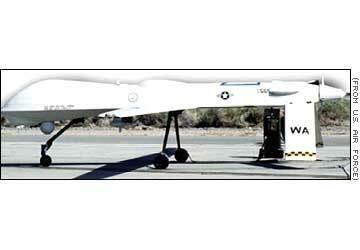 Operates between 50,000 and 60,000 feet and can stay aloft for 24 hours.